In his first speech to the U.N. General Assembly, President Donald Trump reprised misleading talking points on everything from job growth to defense spending. We’ve written about variations of some of these claims numerous times, but since these comments were made to a world audience, we are revisiting some of them. We also cover new claims the president made on foreign issues. Trump boasted that “unemployment is at its lowest level in 16 years.” True, but it is a continuation of a years-long trend that predates his election. Trump misleadingly claimed that “we have more people working in the United States today than ever before.” Since the population constantly increases, that’s not unusual. The employment-to-population ratio isn’t higher “than ever before” — it was higher every month between September 1985 and February 2009. The president wrongly claimed companies are “moving back, creating job growth the likes of which our country has not seen in a very long time.” Jobs have been steadily increasing every month for years. In fact, the job gains have been fewer under Trump than they were during the same time frame in each of the previous four years. Trump boasted that “the stock market is at an all-time high” since Election Day. True, but it has reached new heights regularly since March 5, 2013, when the Dow Jones Industrial Average topped the previous record set in October 2007. Trump said the U.S. “has achieved more against ISIS in the last eight months than it has in many, many years combined.” ISIS territory has been reclaimed at a faster rate under Trump, but more territory was reclaimed from early 2015 to early 2017. The president said the United States “continues to lead the world in humanitarian assistance.” That’s true by volume, but not as a percentage of gross national income, or GNI, according to the Organisation for Economic Co-operation and Development. As a percentage of GNI, the U.S. ranks 20th out of 28 OECD member countries. Trump got ahead of himself when he said “we will be spending almost $700 billion on our military and defense.” The Senate passed a nearly $700 billion defense authorization bill, but it must be reconciled with a House version. And lawmakers still have to pass a separate bill appropriating the money. The president addressed the U.N. on Sept. 19 in New York. The unemployment rate in August was 4.4 percent, up a tick from 4.3 percent in July, but down from the 4.7 percent rate Trump inherited in January. The unemployment rate briefly hit the same 4.4 percent in 2006 and 2007, but to find a rate lower than that, as Trump says, you’d need to go 16 years back, to early 2001. But as with several other statistics, Trump is taking credit for a trend that long predates his presidency. As this chart from the Bureau of Labor Statistics shows, the unemployment rate has steadily declined since its peak at 10 percent in October 2009 during the Great Recession. Trump claimed that “because of our regulatory and other reforms, we have more people working in the United States today than ever before.” In raw numbers, total nonfarm employment hit a record high in August at 146,730,000, according to the Bureau of Labor Statistics. But there’s less there than meets the eye. The U.S. population is also constantly on the rise. There have been “more people working” in the U.S. than ever before many, many times since BLS started tracking the data in 1939. Obama could have made that claim every month from mid-2014 on. By another measure, the employment-population ratio of people in the U.S. age 16 and over was 60.1 percent in August, slightly higher than nearly every month under Obama, according to the Bureau of Labor Statistics. But it’s not the highest ratio “ever.” It was higher in the first two months of Obama’s presidency, and higher every month prior to Obama’s presidency going all the way back to September 1985. Trump wrongly claimed companies are “moving back, creating job growth the likes of which our country has not seen in a very long time.” In fact, the job gains have been fewer under Trump than they were during the same time frame in each of the previous four years. The U.S. has been steadily adding jobs every month since early 2010, according to the BLS. The nation has now experienced positive job growth for 83 straight months, with 76 of those under Trump’s predecessor. Indeed, the job gains under Trump, although similar to those during Obama’s last few years in office, have been slightly lower. The economy added 1,189,000 net new jobs since Trump took office in January. That’s slightly fewer than the 1,375,000 jobs added in the preceding seven months. It’s also fewer jobs than were added during the same time period of 2016 (1,422,000), 2015 (1,547,000), 2014 (1,734,000) and 2013 (1,384,000). Trump also touted the rise of the stock market since his election victory in November. “The stock market is at an all-time high, a record,” he said. That’s true, but it has reached new heights regularly in recent years after recovering from the Great Recession, which plunged the Dow Jones Industrial Average to a 12-year low in 2009. Since March 5, 2013, the Dow has continued to set new milestones: 15,000 on May 3, 2013; 16,000 on Nov. 21, 2013; 17,000 on July 3, 2014; 18,000 on Dec. 23, 2014; and 19,000 on Nov. 22, 2016 — all while President Barack Obama was in office. The stock market has continued its remarkable run under Trump. The Dow broke 20,000 on Jan. 25, a few days after Trump’s inauguration, and then 21,000 on March 1 and 22,000 on Aug. 2. The Dow closed on Sept. 18 at 22,331.35 — up 13.2 percent since 19,732.40 on Jan. 19, the day before Trump took office. By comparison, the Dow was up 13.1 percent during that same time period a year ago, from 16,016.02 at close on Jan. 19, 2016, to 18,120.17 at close on Sept. 19, 2016. So, while Trump boasts of the stock market being at an all-time high, the Dow Jones is actually just keeping pace with last year. We find that while the ISIS territory has been reclaimed at a faster rate under Trump, more total territory was reclaimed during the last few years of Obama’s presidency. Trump: In Syria and Iraq, we have made big gains toward lasting defeat of ISIS. In fact, our country has achieved more against ISIS in the last eight months than it has in many, many years combined. We seek the deescalation of the Syrian conflict and a political solution that honors the will of the Syrian people. We asked the White House press office about this claim, and a similar boast Trump made in late August, when he claimed “record-breaking success” against ISIS since his inauguration. But we haven’t received an on-the-record response. The Post quoted Brett McGurk, the State Department’s special presidential envoy for the Global Coalition to Counter ISIS. McGurk credited moves by Trump, such as giving more decision-making authority to on-the-ground commanders rather than the White House, for increasing success against ISIS. He said, according to the Post, that ISIS had lost about 27,000 square miles of territory in Iraq and Syria since a peak for the group in early 2015. And nearly a third of that — about 8,000 square miles of territory — had been regained during Trump’s time in office. That certainly shows an “accelerated” gain, as McGurk said. But there would have been more achievement – more than two-thirds of the territory reclaimed – from early 2015 to early 2017. That’s the opposite of what Trump claimed in his U.N. speech. The president could have instead said that the rate at which ISIS had lost territory had increased under his presidency. Other data lend support to that as well. The analytics and consulting firm IHS Markit released an analysis in late June that said ISIS had lost 30,400 square kilometers from January 2015 to January 2017, and another 24,200 square kilometers from the beginning of January through June. The terrorist group’s territory totaled 90,800 square kilometers in January 2015, IHS Markit’s first estimate. Those numbers show a 33.5 percent drop in Islamic State territory from 2015 to 2017, but a 40 percent drop since January, which of course would include nearly three weeks of the Obama administration. 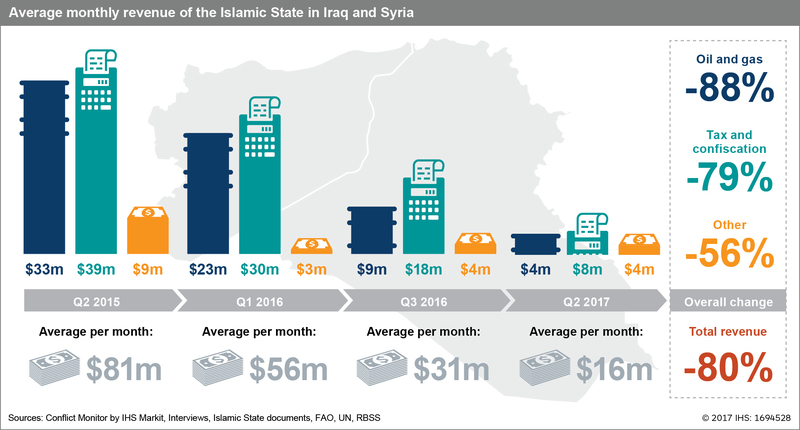 IHS Markit also released figures on the decline in the average monthly revenue for ISIS, though the time periods don’t allow for a comparison of the drop under Obama and Trump. The figures show a 62 percent decline in average monthly revenue from the second quarter of 2015 to the third quarter of 2016, and another 48 percent drop from the third quarter of 2016 to the second quarter of 2017. The analysis said the Islamic State was “unlikely to survive” in 2018. Trump said the United States “continues to lead the world in humanitarian assistance.” That’s true by volume, but not as a percentage of gross national income, or GNI, according to the Organisation for Economic Co-operation and Development. As a percentage of GNI, the U.S. ranks 20th out of 28 OECD member countries. In April 2016, the OECD issued a report on “official development assistance,” or ODA, by its member countries in 2015. The U.S. is a member of the OECD’s Development Assistance Committee, and 28 of those countries combined gave a total of $131.6 billion in aid in 2015 to developing countries — led by $31.1 billion from the U.S.
“The United States continued to be the largest donor by volume with net ODA flows amounting to USD 31.1 billion in 2015, a fall of 7.0% in real terms compared to 2014,” the report says. (Net ODA is the amount after deducting loan repayments.) Other top donors by volume in 2015 were the United Kingdom, Germany, Japan and France. But the report also says that the U.S. — which has the world’s largest economy — was well below the OECD average as a percentage of gross national income. The U.S. net ODA was 0.17 percent of its GNI; the OECD average was 0.30 percent. Sweden had the highest figure at 1.4 percent of its GNI (see chart 1). Using the “broadest definition of aid,” CRS said that the U.S. provided $48.57 billion in foreign aid in fiscal year 2015, including military assistance. CRS said it used the OECD data for the sake of international comparisons, noting that the U.S. “often ranks low” when its foreign aid is measured as a percentage of GNI. CRS, June 17, 2016: Even as it leads in dollar amounts of aid flows to developing countries, the United States often ranks low when aid is calculated as a percentage of gross national income (GNI). This calculation is often cited in the context of international donor forums, as a level of 0.7% GNI was established as a target for donors in the 2000 U.N. Millennium Development Goals. In 2014, the United States ranked at the bottom among major donors at 0.19% of GNI, tied with Japan (0.19%). Sweden ranked first among top donors at 1.10% of GNI, followed by Norway at 0.99%, while the United Kingdom ratio was 0.71%, France 0.36%, and Germany 0.41%. In 2015, Denmark, Luxembourg, the Netherlands, Norway, Sweden and the United Kingdom were the only countries that “exceeded the United Nations’ ODA target of 0.7% of GNI,” the OECD report says. Trump got ahead of himself when he said “it has just been announced that we will be spending almost $700 billion on our military and defense.” The deal isn’t final. There is a two-step process for government funding: Congress first must pass an authorization bill and then an appropriation bill. On Sept. 18, the Senate — by a vote of 89-8 — passed its version of the National Defense Authorization Act for fiscal year 2018. The bill reportedly authorizes about $640 billion for base defense spending — nearly $37 billion more than Trump’s budget request — and another roughly $60 billion for additional war spending. But the bill still must be reconciled with the House-passed version before it goes to Trump for his signature. And compared with the Senate bill, the House bill included about $632 billion for base defense spending and almost $65 billion for war spending, according to The Hill. On top of that, Congress will still have to vote on a separate bill to appropriate the authorized spending, as both the House and Senate bills exceed the caps imposed by the 2011 Budget Control Act that mandated automatic cuts in military spending. For now, as we have previously written, the Defense Department will start the new fiscal year on Oct. 1 with no increase in funding. Trump signed a continuing resolution on Sept. 6 that he negotiated with Democratic leaders that kept defense spending at the same level as fiscal 2017 for the first three months of fiscal 2018. White House website. “Remarks by President Trump to the 72nd Session of the United Nations General Assembly.” 19 Sep 2017. Bureau of Labor Statistics. Unemployment rate. Labor Force Statistics from the Current Population Survey. Accessed 19 Sep 2017. Bureau of Labor Statistics. All employees, thousands, total nonfarm, seasonally adjusted. Employment, Hours, and Earnings from the Current Employment Statistics survey (National). Accessed 19 Sep 2017. U.S. Census. “U.S. and World Population Clock.” Accessed 19 Sep 2017. Bureau of Labor Statistics. Employment-Population Ratio. Labor Force Statistics from the Current Population Survey. Accessed 19 Sep 2017. Schipani, Vanessa, and Eugene Kiely, Lori Robertson and Robert Farley. “FactChecking Trump’s Climate Speech.” FactCheck.org. 1 Jun 2017. DeYoung, Karen. “Under Trump, gains against ISIS have ‘dramatically accelerated.’” Washington Post. 4 Aug 2017. Press release. “Islamic State Territory Down 60 Percent and Revenue Down 80 Percent on Caliphate’s Third Anniversary, IHS Markit Says.” IHS Markit. 29 Jun 2017. O’Hanlon, Michael, Brookings Institution. Email interview with FactCheck.org. 19 Sep 2017. Lardner, Richard. “Senate backs bill to pump $700 billion into military.” Associated Press, via Chicago Tribune. 18 Sep 2017. Carney, Jordan. “Senate passes $700B defense bill.” The Hill. 18 Sep 2017. Gay Stolberg, Sheryl. “Senate Passes $700 Billion Pentagon Bill, More Money Than Trump Sought.” New York Times. 18 Sep 2017. Gold, Joe. “US Senate passes budget-busting $700 billion defense policy bill.” Defense News. 18 Sep 2017. O’Brien, Connor. “House passes budget-busting defense policy bill.” Politico. 14 Jul 2017. Kiely, Eugene. “Explaining McCain’s Defense ‘Cut.’” FactCheck.org. 12 Sep 2017. “DAC member profile: United States.” Organisation for Economic Co-operation and Development. Undated. Accessed 19 Sep 2017. Press release. “Development aid rises again in 2015, spending on refugees doubles.” Organisation for Economic Co-operation and Development. 13 Apr 2016. “Report for Selected Countries and Subjects.” International Monetary Fund. Undated. Accessed 19 Sep 2017. Twin, Alexandra. “For Dow, another 12-year low.” CNNMoney.com. 9 Mar 2009. Condon, Bernard. “Dow Closes at New All-Time High, Beating 2007 Record.” Associated Press. 5 Mar 2013. Rooney, Ben. “Dow tops 15,000 on jobs report.” CNNMoney.com. 3 May 2013. Krantz, Matt. “Dow closes above 16,000 for the first time.” USA Today. 21 Nov 2013. Gibson, Kate. “Record-setting day: Dow’s first finish above 18,000.” CNBC. 23 Dec 2014. “Dow Jones Industrial Average tops 19,000 for first time.” Dow Jones Newswires. Nov. 22, 2016. Jackson, Brooks. “What President Trump Inherits.” FactCheck.org. 20 Jan 2017. Light, Larry. “Dow tops 20,000 mark after month-long tease.” 25 Jan 2017. “Dow Jones Industrial Average tops 21,000 for first time.” Washington Post. 1 Mar 2017. Shell, Adam. “Dow closes above 22,000 for first time, as bull run charges on.” USA Today. 2 Aug 2017.